Water, Cyclopentasiloxane, Dimethicone, Glycerin, Isotridecyl Isononanoate, PEG 9 Polydimethylsiloxyethyl Dimethicone, Disteardimonium Hectorite, Dimethicone/Polyglycerin 3 Crosspolymer, Sodium Chloride, PEG 10 Dimethicone, Phenoxyethanol, Methylparaben, Disodium Stearoyl Glutamate, Chlorphenesin, Disodium EDTA, Acrylates Copolymer, Propylparaben, Ethylhexyl Hydroxystearate, Tocopherol, Ascorbyl Palmitate, Aluminum Hydroxide, PEG 9, Ethylparaben, Dipropylene Glycol, Isobutylparaben, May Contain (+/-): Titanium Dioxide, Bismuth Oxychloride, Iron Oxides. I gave this product four stars for a few reasons. I was able to find a color that matched me perfectly (which is a first for me). 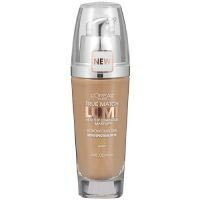 It has decent coverage and is buildable if necessary. I find that if applied correctly and not rushed, it can look fairly natural. It hasn't broken me out (another first). There are only two real downsides. One is that it can look greasy after awhile. Oily face + dewy finish = greasy look. The other downside is how long it lasts. The coverage is good for awhile, but it really only lasts about 5-6 hours. I don't mind the downsides because I think they can be fixed with powder and because I don't wear makeup for long time periods. I would give it a shot at the very least. Doesn't have much coverage. Good for dry skin, which I have. Wore it for 5 hrs & face is covered in spots now. As long as I stick w my skin care routine, I'm not usually sensitive to makeup products either. Proceed w caution!